...being served in the university cafeteria. 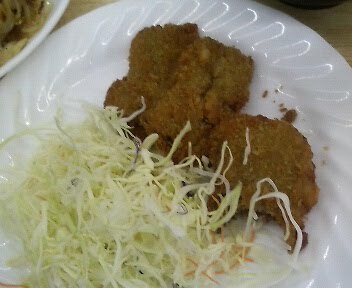 I took this pic of クジラカツ (whale cutlet) at my university cafeteria. Didn't taste bad either; better than the curry. It cost about 6 dollars, a bit pricier than their usual fare of noodles and sliced beef on rice. In universities in the West it would be inconceivable to serve up whale meat in the cafeteria. There would be riots and demonstrations. You would probably get less of an outcry if you put baby meat on the menu. Part of the difference is the Japanese attitude toward whaling, but another part is the political atmosphere at universities here. There is none to speak of. No gender studies departments pushing political correctness. No campus clubs advocating action to protect the environment. No schools of thought, inside or outside classrooms, looking at society or history or politics from a leftist perspective. The whale cutlet was consumed on a table surrounded by other tables full of students from the kendo club, the football club, the dance club, students studying chemistry, students applying makeup, students sitting in their class groups, students glancing shyly at me, students talking about teachers or tennis or the food or their boyfriends. It is true that the combative atmosphere of the 80's, let alone the 60's, is fading from Australian universities. Full fee paying students have sacrificed for their place in the system and are therefore invested in protecting that system rather than rocking the boat. But my Japanese university is ridiculous. Can't somebody be upset about something? Isn't a cutlet on the bone? If so, a whale cutlet must have been enough to feed your whole table. I'm assuming the photo in the blog is not to scale. Perhaps 1:1000 is more accurate.